President Obama thinks he can prevail in the government shutdown fight by deliberately making life as difficult as possible for the maximum number of ordinary Americans. We’ve seen this before. After suffering a defeat on the sequester, he made himself a laughingstock (as illustrated by these cartoons) with his Chicken-Little warnings that a tiny bit of fiscal restraint would grind government to a halt. But his sequester hysterics are trivial compared to what the Obama Administration is doing today with the National Park Service. Here are some unbelievable excerpts from Mark Steyn’s funny yet horrifying National Review column. …the one place where a full-scale shutdown is being enforced is in America’s alleged “National Park Service,” a term of art that covers everything from canyons and glaciers to war memorials and historic taverns. The NPS has spent the last two weeks behaving as the paramilitary wing of the DNC, expending more resources in trying to close down open-air, unfenced areas than it would normally do in keeping them open. It began with the war memorials on the National Mall — that’s to say, stone monuments on pieces of grass under blue sky. Not content with that, the NPS shock troops then moved on to insisting that privately run sites such as the Claude Moore Colonial Farm and privately owned sites such as Mount Vernon were also required to shut. When the Pisgah Inn on the Blue Ridge Parkway declined to comply with the government’s order to close (an entirely illegal order, by the way), the “shut down” Park Service sent armed agents and vehicles to blockade the hotel’s driveway. Think that’s bad? Read on. ..in South Dakota, having closed Mount Rushmore the NPS storm troopers additionally attempted to close the view of Mount Rushmore — that’s to say a stretch of the highway, where the shoulder widens and you can pull over and admire the stony visages of America’s presidents. What happened in Yellowstone, though, is surreal. Like something from Cambodia during the Pol Pot years. No bathroom stops?!? Has the bureaucracy really become this punitive and vindictive? Sounds like the Park Service has the same training program as the IRS. I wonder if the “you-are-recreating” ranger is related to Mr. Norlander? Ironically, American citizens now have less rights to “public land” than English peasants in 1217. …in actual monarchies the king takes a more generous view of “public lands.” Two years after Magna Carta, in 1217, King Henry III signed the Charter of the Forest, which despite various amendments and replacement statutes remained in force in Britain for some three-quarters of a millennium, until the early Seventies. If Magna Carta is a landmark in its concept of individual rights, the Forest Charter played an equivalent role in advancing the concept of the commons, the public space. Repealing various restrictions by his predecessors, Henry III opened the royal forests to the freemen of England, granted extensive grazing and hunting rights, and eliminated the somewhat severe penalty of death for taking the king’s venison. The NPS have not yet fried anyone for taking King Barack’s deer, but it is somewhat sobering to reflect that an English peasant enjoyed more freedom on the sovereign’s land in the 13th century than a freeborn American does on “the people’s land” in the 21st century. Yet all this abuse serves no purpose for open-air parks and monuments. The geyser stasi of the National Park Service have in effect repealed the Charter of the Forest. 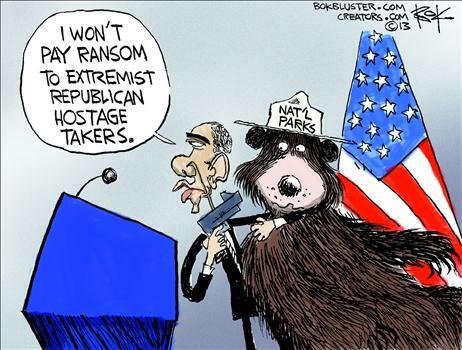 President Obama and his enforcers have the same concept of the royal forest that King John did. The government does not own this land; the Park Service are merely the janitorial staff of “we the people” (to revive an obsolescent concept). No harm will befall the rocks and rivers by posting a sign at the entrance saying “No park ranger on duty during government shutdown. Proceed beyond this point at your own risk.” And, at the urban monuments, you don’t even need that: It is disturbing that minor state officials even presume to have the right to prevent the citizenry walking past the Vietnam Wall. The National Park Service should be out of the business of urban landmarks, and the vast majority of our “national” parks should be returned to the states. In my libertarian fantasy world, I have a list of priorities. I start with big things like entitlement reform and flat tax. Then I move to medium goals like shutting down the department of agriculture and getting out of NATO. At the bottom of my list are things like ending the drug war. It used to be that getting rid of national parks was in this category. But the bureaucrats at the NPS have behaved so despicably that this is now much higher on my list of priorities. Simply stated, they’ve earned our disdain. Let’s close with some amusing cartoons on this topic. This Nate Beeler gem may be my favorite from today’s collection. 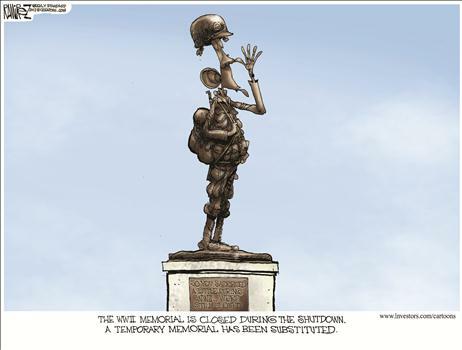 Michael Ramirez unveils a monument to arrogance. Chip Bok shows who’s the real ideologue. 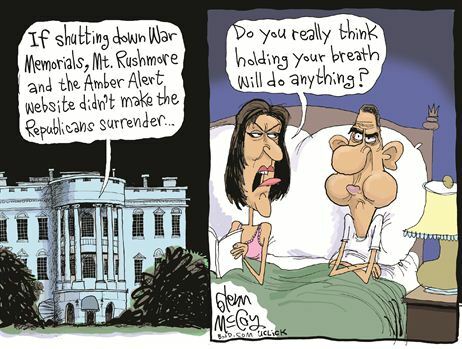 Last but not least, Glenn McCoy captures the President’s petulance. P.S. Other examples of government shutdown humor can be enjoyed by clicking here, here, here, here, and here. P.P.S. Excerpts from some of my other favorite Mark Steyn columns can be read here, here, here, here, here, here, and here. One has to wonder what would have happened if the visitors to these sites would have stormed those who were guarding them- having the benefits of higher numbers. Would those armed officers have shot somebody? If so, this would have made the perfect “Kent State moment” for libertarian causes. Of course, libertarians seem less willing to give their lives for a cause. that’s why they never win these battles. it’s just another indication that the government is no longer on our side……………..
Are u not saving public money from closing the NPS sites? No eyes will be opened. With every passing day my European experiences confirm that the degree of vigilance needed to avoid Europeanization is beyond what the average American voter-lemming imagines. The road to serfdom is much more ingenious than most Americans imagine, naturally self-leveling and naturally finding the path of least resistance to expand. It is not any one person’s evil plan. It is the inherent natural order of human societal dynamics. Cuddly, lovable and benevolent institutions, with huge followings, like WWF, Greenpeace, EDF etc. are looking forward to the fences becoming permanent even after the inevitable reactivation of the NPS. While shutdown gimmicks bring the deviant tactics of government expansion to the forefront, the thuggish, ubiquitous and increasingly intimidating behavior that authorities project at US national parks is not a new phenomenon. There is a pervasive authoritarian tension when one visits those parks, and it can be primarily attributed to laws now been instigated by a majority who are increasingly becoming urban dwellers (and soon increasingly Euro-style apartment dwellers) who have little interest in nature other than the occasional urbanite walk or “been there done that ‘wild’ (yeah dude really wild you had to go without Starbucks for a whole day!) adventure”. The focus of these urban dwellers is now increasingly concentrating on raising obstacles for distant others who want to enjoy distant parks. Parks that the apartment dwellers themselves are unlikely to frequent. 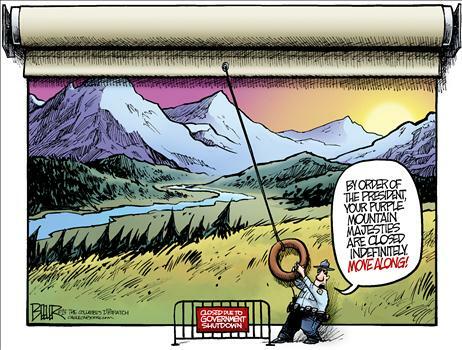 So when it comes to obstacles against Arizonans enjoying their local parks? The New Yorker says yes! And so do a majority of dwellers in other distant states, especially those confined to city apartment living. So this too will pass. Look for ever more collective control over national parks in the future. And as a swelling majority of ever crankier apartment dwellers gets drafted into the collective task of liberating mother earth from the compounding high growth rates of capitalism, expect ever more restrictions. Marginal variances will compound to huge differences down the line. Which road will Americans take? It’s starting to become more and more evident…. Outrageous, brutish behavior. Unfortunately it’s becoming par for the course. The only good thing that may come of this is to open the eyes of the people to the fact that govt is inherently evil.